Selinda Camp overlooks the Selinda Spillway, a unique waterway that links the Okavango Delta with the wildlife-rich floodplains of the Linyanti Marshes. 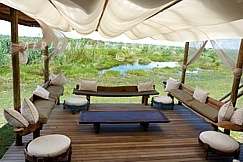 Selinda Camp’s nine spacious tents (including a family unit) are tucked away into the natural vegetation with wonderful views of palm-studded floodplains. 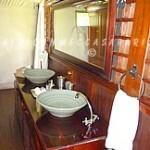 Each tented room has an en-suite bathroom and veranda. 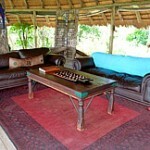 The main area is attractive, cool, under thatch and comprises dining, lounge and bar areas with spectacular views. The open air deck has served many memorable dinners over the years under the stars. 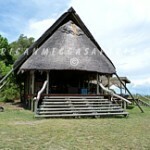 Set apart from the main area is the photo and art gallery built next to the camp’s wine cellar. 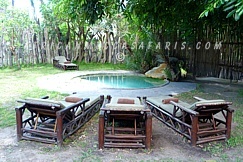 Guests enjoy the cooling plunge pool and the traditional campfire. Daily activities revolve around guided morning, afternoon and night game drives in custom-built 4×4 land Cruisers, boating and seasonal fly-fishing. 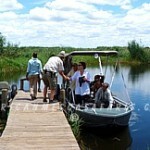 Nature walks accompanied by an armed guide are a Selinda specialty. 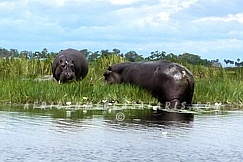 Lying next to to the Linyanti, the 135 000-hectare Selinda Concession is ecologically alike but differs in the increased size of its floodplains. Like the Linyanti, in the dry winter months, enormous elephant herds dominate the large mammal landscape and concentrate close to the enduring Zibadianja Lagoon (the ‘source’ of the Savute Channel). As Botswana is so flat, this river can flow in one of two directions or – as happens in some years – it can flow in both! 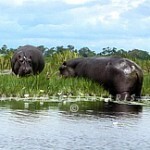 Waters from the Okavango Delta discharge into the Selinda Spillway and flow from west to east. In the extreme east of the Selinda Reserve, waters from the Kwando and Linyanti rivers and floodplains powers their way up the Selinda Spillway from east to west. Only in years of exceptional water levels in both these systems does the water that flows in from both the east and the west link up. 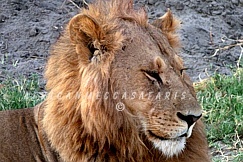 Made famous in Dereck and Beverly Joubert’s National Geographic films (Ultimate Enemies, Hunting with the Moon, The African Diaries), the Selinda Reserve is home to the hippo-killing lions. 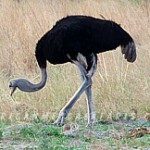 The hunting of large prey by lions is legendary, and a highlight, but random of course. It’s never definite but always a prospect. 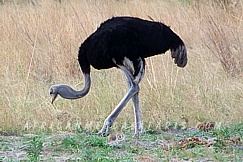 This is wild Africa, unpredictable and magical, where each day is different. The open plains are an ideal habitat for cheetah and the thicker woodlands are sanctuary for leopard. One of Africa’s most endangered predators, the African wild dog, is usually an inhabitant and the Selinda pack frequently dens in close vicinity to the camp. 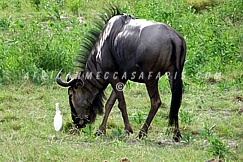 Other common species include: large herds of buffalo, zebra, hyena, waterbuck, kudu, wildebeest, hippo, steenbuck, lechwe, and impala. Nocturnal species include civet, serval, wildcat, honey badger, springhares, aardvark and aardwolf. Birding too is unique here including Collared Palm-Thrush, Arnott’s Chat and brilliant flocks of Carmine Bee-eaters hitching rides on Kori Bustards. 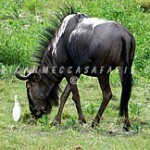 Game drives are fruitful with a variety of antelope, hippo, giraffe, zebra, wildebeest, elephant and buffalo to be seen. 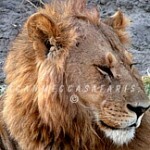 Predator viewing is exceptional including lion, leopard, wild dog and cheetah. 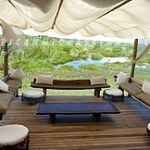 Day and afternoon game drives via 4 open-sided Toyota Land Cruisers (with removable canopies). Each vehicle has seats 8 with 6 “window” seats plus the one up front next to the guide. 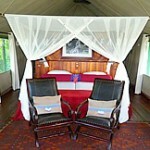 The camp has a supply of bean bags for guests to use to steady their camera while on a game activity. 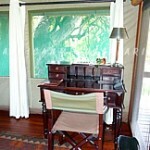 Short walks from camp and from game drives. Massage therapies are available either in the guest’s tent or in the gallery. 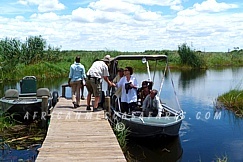 Boating activities along the Selinda Spillway, its lagoons and waterways. Canoeing along the Selinda Spillway in season. Fishing – we do have both bass rods and fly fishing rods with some basic equipment. Avid fishermen are welcome to bring their own equipment along. Double beds available on request with linen and mattress convertors. 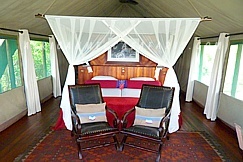 This camp usually accommodates 16 guests plus tour leader/guide/pilot but can, on request, accommodate 18 and at a push 20 guests can be accommodated. 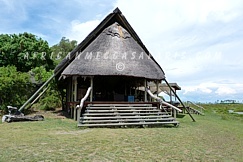 Large “Chobe-style” tents under thatch with each on a raised wooden deck. 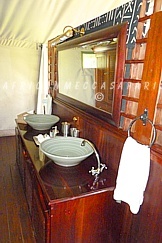 En-suite bathroom with stone bath, twin vanity basins, flush toilet and shower. 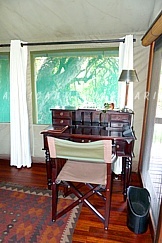 Sliding door access through front of tent from large veranda. Sliding door entrance between bedroom and bathroom. Fans and mosquito nets are standard. 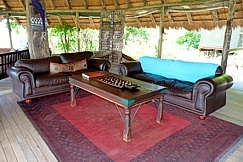 Main area comprises a large decked area (lounge, under thatch dining, star deck, tea deck). Photo/art gallery and quiet reading area. Traditional campfire on the ground and under the stars. Children over the age of 6 years are welcome, however, private activities need to be booked and paid for. The minimum age for boating activities is 6 years, while canoe and walking activities have a minimum age of 12 years. 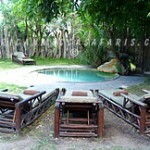 Selinda airstrip is about 40 minutes drive and boat from camp.